Taylor Teeden’s 152 points led all Tri-Star competitors. 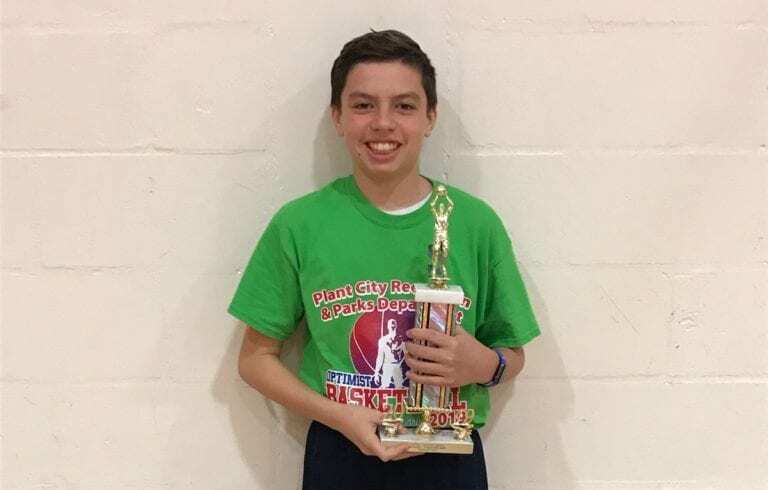 The Feb. 2 Tri-Star Basketball Skills Competition at Tomlin Middle School featured many great performances by the area’s young hoopers, but nobody on the Tigers’ home court scored more points than Taylor Teeden. Teeden, who plays guard for Tomlin’s basketball team, finished with 152 in the shooting, dribbling and passing competition to lead all competitors on the day. Know someone who deserves an Athlete of the Week feature? Email Justin Kline at JKline@plantcityobserver.com by the Friday before the next issue. You came out here and did a great job. How were you feeling today? I felt great. I came out here expecting to do my best. I just wanted to come out here and have fun. I didn’t expect to get first place and score the most points. It feels good. How long have you been competing in the Tri-Star events? Ever since I started playing, like five years now. You’ve also played baseball with your brother, but are sticking to basketball now. What made you want to pick basketball over everything else out there? I just like the fast-paced game and I’m pretty good at it. It’s doing what’s fun for me and I enjoy it. Your dad (Billy Teeden, Plant City High School varsity boys basketball head coach) knows a thing or two about the game. What’s some of the best advice he’s given you? Keep your head up and don’t listen to anybody in the stands, except for your coaches. I love playing guard. I love having control of the ball. You’ll be in high school next year and I’m guessing you’ll end up playing for your dad at some point. Are you excited to move up? Yeah I’m excited. He’s coached me when I was younger, too. What sport have you never tried, but would if you could? Who are some pros you try to play like on the court? James Harden is my favorite NBA player and I watch a lot of LeBron, too. I love scoring and I love trying to be smart and draw fouls, too. If you could meet any famous coach or player, who would it be and what would you want them to teach you? Probably Coach K (Mike Krzyzewski, Duke). I’d ask for basketball advice. What’s something about the game you’ve learned that someone younger than you, maybe someone at these Tri-Star competitions, might want to know? Always keep your head up and have a good attitude. How do you get ready for a game? I drink an energy drink to get ready and get pumped up. What’s the coolest thing you’ve done on a basketball court? I made five threes in one game for the win.